Closure is easily pierced by an oral syringe and reseals when syringe is removed. Dispense quickly with confidence. Dispensing cups are not clearly marked and ordinary “teaspoons” vary by size. 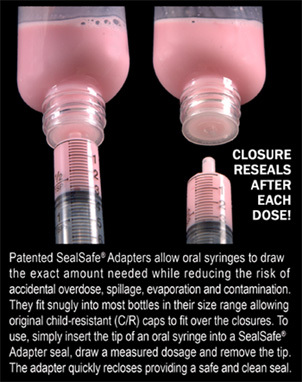 Do-It Safe® with the SealSafe® dosing adapters and ensure that every dose is the right dose¹. Safely and accurately dose medications for adults, infants, children and pets.